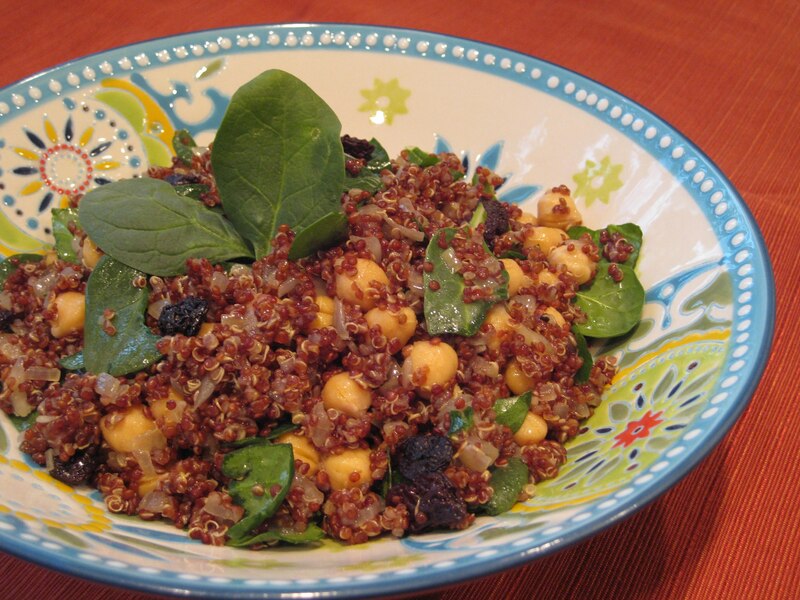 Ok, here it is, one of the tastiest quinoa recipes I know! It is so utterly simple in its ingredients and preparation yet so SUPER-DELICIOUS!!! When fresh cherries are in season, you’ll want to use them. This dish can take center stage as the main course of a meal or be a crowd pleasing side dish. I often make this for dinner and then have the leftovers a few days for lunch. It tastes just as good cold as it does warm, although I prefer room temperature best. If I feel I need more animal protein, I will add cooked chicken or fish, or throw a fried egg on top. 1. Bring a tad less than 2 cups of water and a pinch of sea salt to a boil. 2. Rinse quinoa well in a fine-mesh strainer. Add quinoa to the boiling water. 3. Return to a boil and immediately lower heat to a simmer, cover and cook for about 15-20 minutes, or until water is evaporated. Lift the lid at 15 minutes to check on the water level. 4. Chop onion and caramelize. To caramelize an onion, in a large skillet, over a med flame, heat 2-3 TBSP of olive oil. When oil is warmed add the chopped onion and a pinch of sea salt. Let it cook for a few minutes until translucent. During the first few minutes, do not stir the onion. When it is translucent, stir the onion and lower the flame. Cover the skillet partially. Leave the cover askew so a little steam can escape and cook it like this for 10 minutes or so. You want the onions to turn a light caramel color and be very sweet. Keep an eye on it and add some more oil or water if necessary to prevent sticking and burning. 5. When quinoa is done cooking remove the pot from the heat, fluff it with a fork and let in sit covered for 10 minutes. Pour it in to a bowl and add a few glugs of olive oil. 6. Combine all other ingredients in with the quinoa. Season to taste with salt and olive oil. Praise and Enjoy!